ORLANDO, Fla. (CNS) — Young parents with financial struggles coupled with underdeveloped endowment, fundraising and alumni infrastructure at Catholic elementary schools may help explain why the primary schools are not faring as well as Catholic secondary schools nationwide. That was the opinion of a panel of Catholic education experts convened April 7 by the National Catholic Educational Association during a review of the organization’s 2014-2015 annual statistical report on schools, enrollment and staffing. 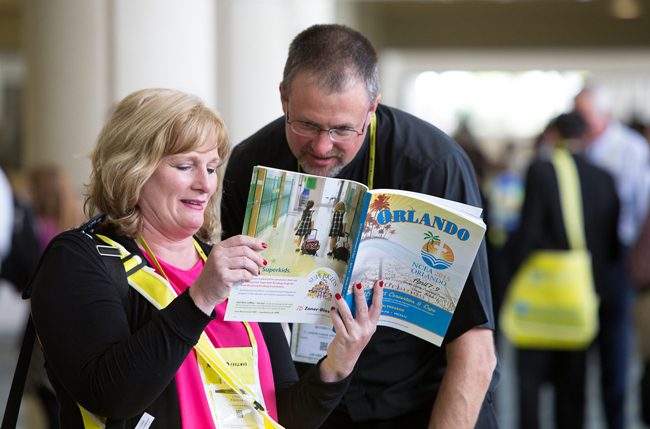 The conversation took place during a news briefing at the annual NCEA convention held April 7-9 at the Orange County Convention Center. Broadly, the NCEA report notes a continued Catholic school enrollment decline since its highpoint in the 1960s, and a 21 percent drop since 2005 — primarily in the East Coast and Great Lakes regions previously populated by a concentration of Catholic immigrants from the past century or two, according to the report. Still, there is a strong demand for Catholic schools generally, with waiting lists now found at some 31 percent of schools but primarily in suburban areas — pointing to a geographical challenge for sustaining inner-city Catholic schools. Tuition remains the single largest obstacle to parents’ ability to enroll their children in Catholic schools. Total Catholic school student enrollment for the current academic year is not quite 2 million students at 6,568 schools nationwide, most of them elementary. Twenty-seven new schools opened while 88 consolidated or closed. “One of our key problems in terms of managing enrollment schools is that we have burgeoning Catholic populations in parts of the country where we don’t have schools and we have schools where the population has decreased over the years due to economic factors — so a big challenge would be to build schools where we actually have Catholic (families) now,” said Sister Dale McDonald, a Sister of the Presentation of the Blessed Virgin Mary, who is NCEA public policy and research director. In addition, the statistics show that Catholic secondary schools have maintained or grown enrollment over the last several years, and the question is why high schools are maintaining enrollment and elementary schools are not, according to Patrick Lofton, NCEA executive vice president, who added that Catholic schools need “to tell their story better” in terms of messaging, marketing and community relations. “You can say that many Catholic high schools run from a very sound business plan with a governance structure that is made up of a nonprofit board that advances its strategic goals and missions,” Lofton said, adding that elementary schools could be more sustainable and viable by adopting better business practices found at high schools and even colleges. Christian Brother Robert Bimonte, NCEA president, pointed out that tuition costs are very challenging for the younger parents associated with having elementary school-age children. Often those parents have college student loans of their own which they are still paying down or saving for children’s college funds. “The average tuition in this country for elementary school children is about $4,000 and that can be a challenge for young families,” Brother Bimonte said. Panelists added that he urge consideration of new tuition models and sliding-scale tuition in light of the high college loan debt that young adults now have. There also is a need at elementary schools to look for better governance models, alumni networks and business fundraising efforts associated with secondary schools. “We have to think about spending money to make money so that Catholic education is accessible; we have to think about new leadership and governance structures and we have to adopt some of the practices at the elementary level as seen at the secondary schools,” Lofton said, adding that he thinks the same principles could be applied to good parish management. “If a parish begins to struggle, the school begins to struggle,” Lofton said. In terms of geographic and regional disparities, and Catholic school closures in U.S. inner cities, Orlando Bishop John G. Noonan, whose diocese was the local host of the NCEA convention, urged a community approach at the diocesan level to preserve Catholic education in the inner city. “We can’t neglect the inner-city school and you can adopt parishes and there are ways and means to do that; we are not going to walk away from the inner city,” Bishop Noonan said, adding that sometimes aging school structures become too expensive to keep up and it is better to rebuild if that is possible. Lofton added that the church has a responsibility to minister in the inner city, and has to reach out to philanthropists in the country who will assist both middle-class and inner-city parents with children in Catholic schools.